We love laughter, and wedding stories! We often hear when something big like a wedding is happening in the lives of our customers. Whether it’s the story of the couple or a confession of something that went wrong, customers enjoy telling us about it and often embellish the facts for the benefit of everyone – staff and other customers, to hear. We are a ready-made audience to be relied on for a laugh or to respond to a dramatic story about a proposal. As stylists, we are on show and performing all day long so at work one of the things that gets us through is humour. We love humour, and sometimes perform together with our customers. Stories can sometimes cause a big loud laugh and hilarity to break out amongst everyone in the salon. When that happens, everyone there wants to get involved, everyone wants to listen in to the story – everyone wants to know what’s going on. I once had to sit down on the floor behind my restyle for a wedding customer in a fit of giggles unable to continue and be surrounded by her cut-off lengths of hair – I can still remember soft pillows of semi-circular dry fluff rising and falling about as I choked back tears of laughter…that was a-long time ago now…. She had just told me she was in love, and getting married. I rushed off while she was being shampooed and bought her a pink balloon with ‘congratulations’ on it and tied it to her chair for her return. She had lovely long locks. I looked after them every week; colour and cut or cut and blow-dry, highlights, semi’s and shine treatments. She walked off, pleased as always with her hair and her balloon, having planned and agreed a new short look with me for the wedding over a few months. We agreed on a picture. It took me an hour and a half to cut it on the day of the restyle. She had kept really still even though she was excited. Her glasses were off while I worked. We hadn’t talked at all and I’d been concentrating on the cut, replicating the style in the picture she and I had looked at. She put her glasses back on, and showed no emotion at all when I showed her the back of her hair in the mirror. Suddenly I realised she was looking at the front, and was really shocked. With alarming alacrity she became animated and said “I don’t like it” in the way people usually say “I really love it.” I don’t remember why but I had a really embarrassing fit of hiccupping giggles then that wouldn’t stop. I think I gulped, then I laughed, then I fell over and sat down on all her long hair around the floor of the chair. People were bringing me water and banging my back! She laughed too – we were both uncontrollable. Eventually I was able to get up, talk, stop laughing and restyle her hair again until she spontaneously smiled at her reflection in the mirror. We knew each other well again, her trust in me had been restored and she gave me the smiles and assurance this is the moment every hairdresser craves. I vowed I would never forget that episode. I don’t mind rolling around on the floor at home, laughing uncontrollably, but I never thought that would happen to me at work with my staff thinking I’ve completely lost it. It made me think about the importance of being on the same wavelength as our customers, ensuring all my staff have the same understanding and the significance of humour in achieving that. Whilst we are not friends in the same way as other people you know and very rarely go to the wedding we style, we really understand the importance and impact of humour in what we do. Your stories give us the opportunities to share and laugh a lot with you. It’s great to hear your stories. We are always busy with our routines as stylists but sharing a story and a laugh together can be an added bonus to the whole salon experience. Stories and laughter can be like a shot of your favourite coffee or a page from your favourite magazine. And the wedding season is here! 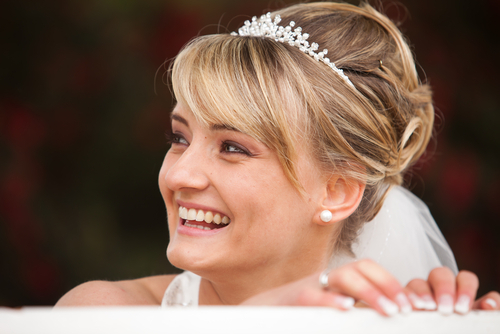 With stylists specially trained in wedding hair, if you are planning a summer wedding in Totnes, we are your hairdressers! P.s., Don’t forget, if you have a wedding story you want to share: from the ceremony, the speeches, the party – anything. Let us know and you could win a free hair-up for you and a friend.